People ask me all the time how they can afford to travel internationally. It’s difficult to answer since everyone has different circumstances. Some people have access to lower-cost airports. Some choose other priorities and wonder why there isn’t money left over for travel. Not everyone can afford to travel everywhere, but the world is far more accessible than people think it is. I’ve written before about how we give the gift of travel to our kids, and I’ve talked about ten ways to save money while traveling. But how do I lower the costs of travel enough that we can take our kids to several countries every year? This is how I do it. I collect frequent flier miles. Even if miles are worth a little less every year, they’re still great for figuring out how to afford travel, and even do it for free. I have three credit cards right now that earn miles or points with every purchase. Different cards give bonus miles for travel, dining, gas or groceries, so I’m sure to always use the right card for each purchase. If there’s a card that gives you a 50,000 mile sign-up bonus, get it. Then cancel that card after you earn the bonus and get another. Play the game. There are A LOT of websites that offer advice about doing this – just Google “travel hacking” to figure out how to afford travel. Once you have the cards, charge everything that you possibly can to create affordable family vacations. For years at my previous job I charged all work expenses that I could to my cards and then got reimbursed by the company. Some years I earned 250,000 miles by doing this. That’s a lot of free trips. How do you make travel affordable? Use your mileage-earning credit card for everything! I’m loyal. By flying United and its Star Alliance partners as much as possible, I’m able to reach 1K status every year. This means that I earn more miles for every flight and also that I have access to an expanded inventory of award flights. I typically use miles for free tickets for my family while paying for tickets for myself, in order to maintain status. Additional benefits to having 1K status are faster check-in and security lines, priority boarding, frequent upgrades and international lounge access, all of which make traveling with kids easier. I plan ahead. Way ahead. I sketch out our travel a year in advance and start looking for the best tickets to keep my focus on how to afford travel. I set up price alerts in Kayak so that I receive an email daily with the ticket prices for the dates I want to travel. I search constantly for affordable family vacations. Sometimes if I find a great fare 10 months in advance, I grab it even if the routing isn’t ideal. Three times out of four the airline will change its schedule and allow me to change to better routing at no additional cost. I look for all routing/ticketing options. If the tickets are expensive to Africa, for example, I might look for a cheap ticket to Dubai or Oman, and then buy a ticket on another carrier from there. Sometimes it backfires, but usually, it works well. For my recent trip with my son to Asia, we went to four countries in 16 days, and I planned the destinations and dates around inexpensive flights. I looked at literally dozens of different ticketing options, and in the end booked 10 flights on 5 airlines on 5 different tickets – 1 open-jaw ticket on United, 1 round-trip ticket on ITI Air and 3 one-way tickets, on Air Asia, Thai Air and Eva Air. It worked perfectly, and I’ll guarantee you I paid less than anyone else doing a similar itinerary. I probably spent 15 hours on the flight research for that trip, but it paid off. I look at different departure airports. In Southern California, we can fly out of several airports, so I price them all to figure out how to afford travel and maximize our dollars. Think about all of your possible departure points within a few hours of home. I go when others aren’t going. Our kids’ school has a different break schedule than most other schools, which lets us book tickets far less expensively than if we’re traveling during peak weeks. But when we do need to travel when everyone else is, I look for the cheapest travel days to create affordable family vacations, even if it means pulling the kids out of school a day early. Leaving Friday before Christmas break or Thanksgiving break can be half the price of flying out Saturday or Sunday. I combine destinations. Since airfare is the leading expense on most trips, if we’re going to Europe, we maximize the trip for affordable family vacations. We’ll spend 5-6 weeks at a time there, relying on low-cost intra-Europe tickets to move around. We rarely go to one destination anywhere in the world and then come straight back home. When I took my daughter to Bali, we added Sydney, mostly because of routing but also because it’s a fun city for a stopover. When my son wanted to go to Easter Island, it was barely more expensive to add stops in Panama City, Santiago and Iguazu Falls. His 2015 trip to Denmark included Oslo, Amsterdam, and Zagreb, again relatively inexpensively. Plitvice Lakes National Park in Croatia was a summer high point, added to our Denmark trip because it was inexpensive to do so. I use TripAdvisor. If I know where we want to go but don’t have a specific hotel in mind, I go to TripAdvisor, search for hotels in that destination, and put in my dates. That brings up pricing for most hotels. I filter the results by “Family Friendly” and then start at the top, looking for the top-rated hotels at the best prices. I contact hotels directly. Once I have a short-list of hotels and rough pricing from TripAdvisor, I write to the hotels directly. I explain that we are a family of five and need an optimal room layout for our ideal dates and ask what their pricing options are. 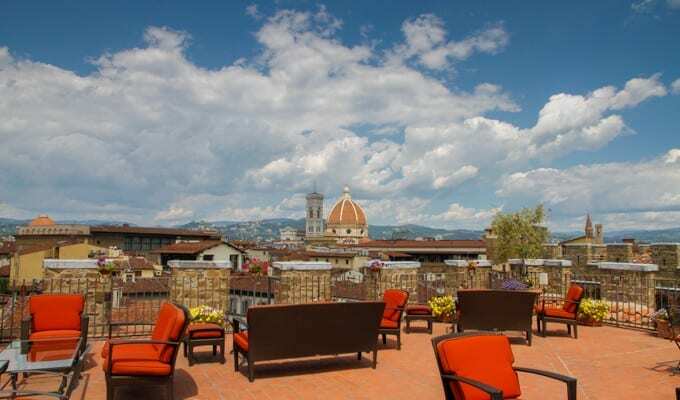 We’ve stayed at some amazing hotels around the world because their reservations agents were a lot more flexible than their websites when it came to accommodating all of us. The Four Seasons Bora Bora and the Rosewood Mayakoba both made exceptions to their official policies and allowed all of us to stay in one room. That cut our costs in half and made nice hotels in amazing destinations comparable to far cheaper places that would require us to get two rooms. I look for value dates. Hotel pricing is usually dependent on expected occupancy. If your dream is to stay at the Four Seasons Bora Bora, figure out when the absolute cheapest time to visit is. If it’s not posted on the hotel’s website, write to them directly. At Six Senses Zighy Bay in Oman. It’s hot in the summer, but it’s also a lot less expensive to visit then. We don’t stay in hotels all the time. Whenever it makes financial sense based on the destination and length of stay, we look to rent apartments. Airbnb is amazing. If you want to take your kids to Paris and your budget is tight, rent an apartment out of the center of town. With the metro, you can move around easily, and you’re having virtually the same Paris experience as someone paying $1000/night at the George V – maybe even better. At our apartment in Paris. Staying in for meals was an additional cost-saver. It’s a huge world. I want to take my kids everywhere, but there’s no reason that trips need to be done in a specific order. If we have spring break to plan, I think of where we can go that week where we won’t be competing with others for plane tickets and hotel reservations. If you want to go to Santorini, don’t go during the summer – prices are far lower in October. 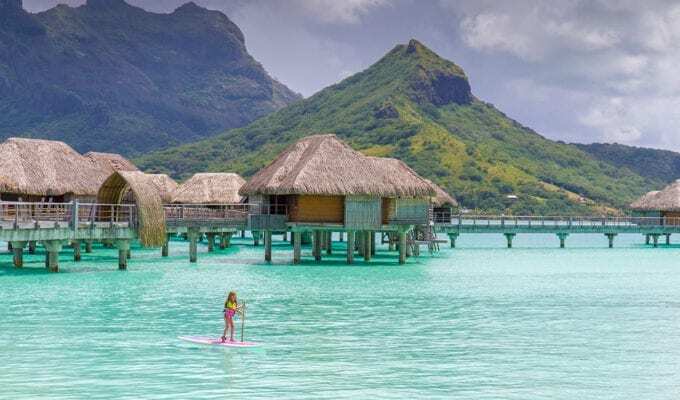 If you want to stay in an overwater bungalow and you can’t make Bora Bora work price-wise, look at the Philippines, Malaysia, Thailand or Mexico for affordable family vacations. The bungalows are cheaper, as are airfare and food. This is probably the biggest difference between frequent travelers and people that dream of traveling but don’t think they can afford it. Frequent travelers make travel their primary budget item. That means that they’re not spending $200/month on cable, or getting new cars every four years, or spending $10/day at Starbucks, or going out to eat frequently, or even getting their nails done. 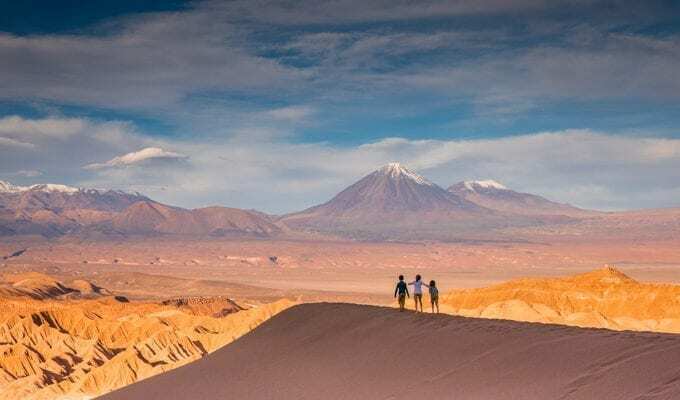 They’re saving everything they can so that when there’s an unexpected $400 cheap fare to Chile, they’re on a plane and having an incredible two-week adventure – all for less than a lot of people spend dining out every month. On Facebook it looks like they’re living dream lives, always posting from amazing places around the world. But really it’s just that they have different priorities. In Barbados, horses are brought down to the sea every morning. It’s free to get in the water with them, and the nearby Hilton is only $159/night. Plane tickets from the US can be inexpensive too. You just have to prioritize your spending to make it work. One thing that we do when talking about how to afford travel, and that I wrote about in my article on giving the gift of travel, is that we minimize gift giving. Birthdays may involve one present. We have a lot of empty space under our Christmas tree. My wife and I rarely give each other presents. We’ve never once gone to a “Doorbuster Black Friday Sale” or bought something just because it was on sale. All of you who are in line at Wal-Mart Thanksgiving night to save 10% on an 80-inch television? That’s fine. But it’s going to delay figuring out how to afford travel. Take your kids everywhere! But never pay more than you have to. There are plenty of ways to figure out how to afford travel. I’ve enjoyed reading your blog the last couple months. I tried doing the travel hacking thing the last yr with some success and have been able to do some cool things (I have 3 kids between 5 and 9). My question is how you stay at the 4 Seasons so often on the cheap, especially with kids. Hi Michael. The Four Seasons is funny. While all of their resorts are amazingly kid-friendly, a lot of them don’t have rooms that sleep more than 3 people, so we would need two rooms. We’ve never stayed at any that would have required this – just too expensive. I think we’ve stayed at 5 in 6 years? Maui and Orlando were during off-peak weeks. In Bali we only got a day room at Jimbaran Bay before an evening flight and it wasn’t expensive. In Bora Bora we went during an off-peak week and we went with a friend who got a second bungalow at half-price. We split the difference, so that brought down the cost somewhat. The only major splurge was Chiang Mai a week ago. I went for it since it seemed like a cool place to spend New Years with my son, and since I’m a travel writer I can tax-deduct these expenses, so that reduces the net cost to me by a third. Even then, it was expensive and I’m not sure it was worth it. Hi Eric. Thanks for this list! The one about routing and ticketing is very useful. I could certainly do a better job on that. I’ve found the last one is by far the big difference for those who travel vs. those who don’t. There are many things my family and don’t do or don’t have so that we can see the world, but those aren’t things people often notice. That last piece of advice is huge. Those little trips to subway for lunch add up quickly. You can save so much money by just packing a lunch, bringing your own coffee, etc. If you want to travel, you have to make it happen! I obviously agree! I get so tired of all of the online comments from people saying only the 1% can afford to take their kids out of the country. Like you said, if you want to do it, make it happen. Just found your blog and am excited to follow your adventures. I have 5 kids and use miles and points to make our trips happen. I also travel alone with just a few kids at a time to keep costs down. My husband doesn’t like to travel but I think it’s important for the kids to experience new places so I take them myself most of the time! Very cool Jessica! If you discover amazingly kid-friendly destinations or hotels, please let me know. I’m always looking for new destinations. Eric – we have 3 kids too. Having 3 kids tips the scale bc it exceeds the max occupancy. I’ve struggled with it. We do AirBnB but sometimes it ain’t a vacation unless there’s some housekeeping (that’s not done by me! ????). The last tip is huge. We also skim on extras so we can travel more. How did you like Bali? I was reading about the travel advisory warning etc. would love to hear more about that. Hi Cheryl – thanks for the comment! Yes, having three kids makes hotel planing infinitely more complicated. The world of travel is designed around families of four. One of my first blog posts was about what I look for in kid-friendly hotels, and my first three items all addressed the complication of traveling with three (or more) kids – https://travelbabbo.com/2014/12/my-kid-friendly-dream-hotel/. We loved Bali – very kid-friendly and, while getting more touristy all the time, still fairly unique. I never pay attention to travel advisories. Bali has always felt safe to me. We were just in the Philippines which officially still has a travel advisory, and we’re off to Kenya next month, another place with warnings in place. If something happens, it happens, but the odds are so tiny that I don’t think about it. My Bali post is at https://travelbabbo.com/2015/03/bali-with-kids/. I wouldn’t be surprised if we go back in the next year. I just discovered your blog today. This is the best blog I’ve come across for traveling with children. We have three children and made the decision to move to France so we have access to lots of cheap traveling. We plan on moving in July of this year-if our visa’s come through. We already booked a trip to Morocco for October (only $145 rt including luggage and assigned seats-so cheap) and I’m constantly looking for more deals. 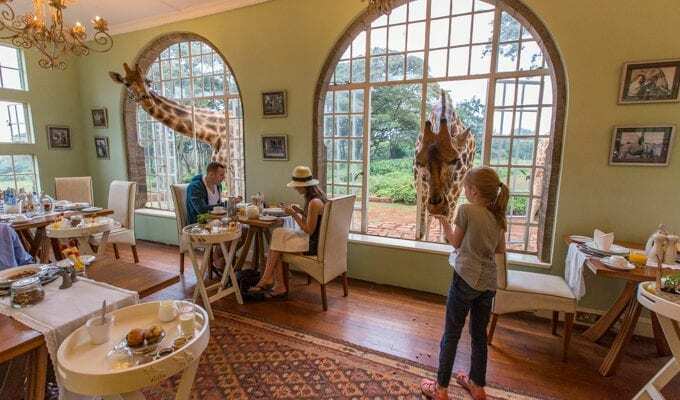 After going through your blog I now am looking into the giraffe park in Africa and many more. I’m starting a blog for our adventures too. You are my traveling with children inspiration! Thank you Cindy! France sounds great – we came very close to moving to Paris a year ago with the kids to do the same, but in the end opted to stay in California. If you find amazing, unknown, really kid-friendly places or activities in your travels, please let me know. I’m always looking for travel inspiration myself! We are doing our first family “travel” vacation later this month and I am so excited! We are just going to Utah’s National Parks (doing Zion and Bryce), 5 hours away from us, but I’ve already got the travel bug. 1) What do you do about food? I mean, both places we’re going to have grocery stores and restaurants, so I know we’ll eat, but how do you keep that cost from just piling up? 2) How do you balance fun vacations with trips to see family? We’ve got family on both the West and East Coast, so we have to take trips out to both those places into consideration each year. Hi Haley. For food we’re flexible. When possible, the best/healthiest/most kid-friendly option is usually a picnic. We go by farmers markets, with grocery stores as backups, and get fruits/berries/veggies/fresh breads/meats/chocolate/wine. The kids can play while we relax, and no one goes away hungry. If we’re in a hotel, I always try to get the hotel to throw in breakfast, if it’s not already included. Some breakfast buffets are excellent – you can eat as late as 10, fill up, and skip lunch. Hi. Great advice, thanks. I’m wondering if you would be able to give helpful hints and suggestions for our family whose holidays have to be taken “prime time” as I teach (and to add a bigger twist, my hubby’s busy time is summer so he gets only a week during the summer months). I know you will have some interesting advice to help us out. We are excited to show the world to our kids. Thanks. Hi Jennifer. This was such a great question that I turned it into a blog post, with the help of several other family travel writers: https://travelbabbo.com/2016/06/tips-peak-season-travel/. Hopefully there’s some advice there that you can use. I just came across your blog. Great post! Travel is such a great experience for kids of all ages. Taking kids out of school and travelling during low seasons is a great way to save some money and avoid the crowds. Hi Eric, thanks for this post – great tips, especially regarding the frequent flyer points. Love it and will try it out! This is a great post. I love the idea of adding stopovers. I just discovered your blog as I’ve been dreaming of traveling more with our kids and I’m determined to make that happen. My husband is an Aussie (I’m American), so we travel to Australia every couple of years from the U.S., which greatly cuts into our travel budget for other places, but even more so our TIME available to go other places. I love going to Australia, but I’m ready to head in other directions as we’ve only been traveling to Australia pretty much for the last 10 years. I’ve got the budget part pretty covered, and the air-travel hacks, but it’s getting the time off that we struggle with. I am very interested in how you allocate your time to travel so often. I know your employment is very flexible, but what about your wife’s employment (or perhaps she is a SAHM like me?) or kid’s school schedule? Thanks in advance! Hi Julie. The time off for us is the easy part. My wife is a SAHM and I’ve crafted a profession that combines my passions for family, travel and photography and can be done from anywhere. So really it’s only the kids’ school schedule that restricts how much we can travel. We have a week for Thanksgiving, three weeks at Christmas, a week for winter break, a week for spring break and three months in summer, and I may pull them out for a week every once in a while. That’s enough that we can get to 10-20 countries a year and have some fun adventures. I actually did the same with my last job in healthcare – crafted it in such a way that I could do it from anywhere, as long as I had my laptop, cell phone and wifi. Part of living in the 2000s: I’ve never kept track of vacation days, but I’ve also never had a week or weekend off-line. Always work and always play. Thanks. I need to get my head more around this. It’s one of the big reasons I haven’t gone back to work (allows us more flexibility) but my husband just took on a management role (ugh) which I feel makes things more stressful and rigid. But, he’s in IT, specializing in the “cloud”, no less, so I feel could totally make this happen. Your schedule is inspiring! Cheers. This was such a great read! Family travel is my passion! We love staying in the cheapest places and visiting the least visited. These are great tips for being able to afford more travel. I keep putting off getting travel credit cards because I’m radically debt adverse but I think it’s time. I need to cut my flight expenses! This is one of the best articles I have read on travel hacking. Thanks for sharing.